When shopping for an outdoor cooler for sale, there are special things that you need to take into consideration versus a traditional cooler that you take to the beach. 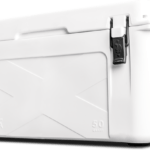 Yeti, Orca, and Pelican make some fantastic high end coolers, but they are not something that you want sitting out on your patio long term. Outdoor coolers on sale tend to have some built in features that make them ideal for keeping out on your patio. We will take a look at these features and more in our Outdoor Cooler Buying Guide. UV Resistance – Since an outdoor cooler will spend most of it’s life outside and exposed to the sun, it’s important that your outdoor cooler is treated with a UV resistant coating. Such coatings help protect outdoor coolers from fading and cracking over time. 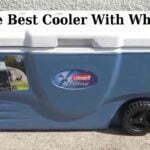 Wheels or Casters – From time to time, you may with to move your outdoor cooler around. For example, you probably won’t want your outdoor cooler sitting in the same spot on your patio all summer. Having a cooler with wheels or casters will make it much easier for you to move your outdoor cooler to a different location. The Best Choice Products® Patio Deck Rolling Outdoor Cooler (65 Quart) is a perfect example of an outdoor cooler with a great set of wheels. Additional Features – A lot of outdoor coolers for sale come with unique built-in features, such as table tops, bottle openers, storage bins, shelves, or baskets. These unique features make outdoor coolers more versatile. Take the Suncast DCCW3000 Resin Wicker Cooler, for example. It has a built-in storage compartment, towel bar and hanging basket. Material – It’s imperative that your outdoor cooler is made of the most durable materials possible. That’s why you will see most quality outdoor coolers made out of stainless steel or wicker. The Trinity TXK-0802 Stainless Steel Cooler is a stainless steel cooler that consistently receives praise and good reviews. Some outdoor coolers for sale are more than just coolers. Some could even be called works of art, while others act as furniture pieces. Take, for example, the Keter Rattan Patio Pool Cooler Table. This 3 in 1 product can serve as a coffee table, cocktail table, and patio cooler. This is definitely one of our favorite outdoor coolers for sale. Not only is it a beautiful piece of furniture on your patio, it proves extremely useful at both sun and sun down. An outdoor cooler cart is simply an outdoor cooler with wheels that also has some type of shelf, thus giving you the option to use it as a cart. The Best Choice Products® Patio Deck Rolling Outdoor Cooler (65 Quart) and the Trinity TXK-0802 Stainless Steel Cooler that we mentioned earlier are both considered to be an outdoor cooler cart. The Outsunny B2-0012 Rolling Ice Chest (80-Quart) is another highly rated outdoor cooler cart for sale. Outdoor cooler carts offer more versatility when being used on a patio, since you can use them to move food or drinks around more easily. Whether you need an outdoor cooler cart or just a standard patio cooler really depends on how you plan to use it.